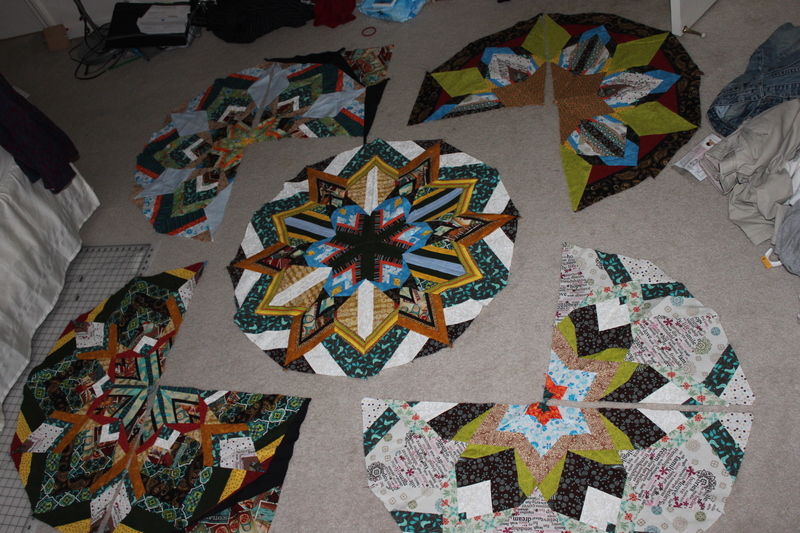 I belong to a Long Distance Quilting Bee. Each month we mail blocks to a member, and the member getting the blocks chooses the theme or pattern they desire to be mailed to them. Fun huh? Well, now that the year is half over I’m going to play catch up & post all the blocks I’ve made so far. At least we didn’t start until March so there really aren’t TOO many to back-post. March’s theme was HIPPIE. I drew this hand & then pieced it all together. I had never done free form before this, so I’m happy with how it turned out. 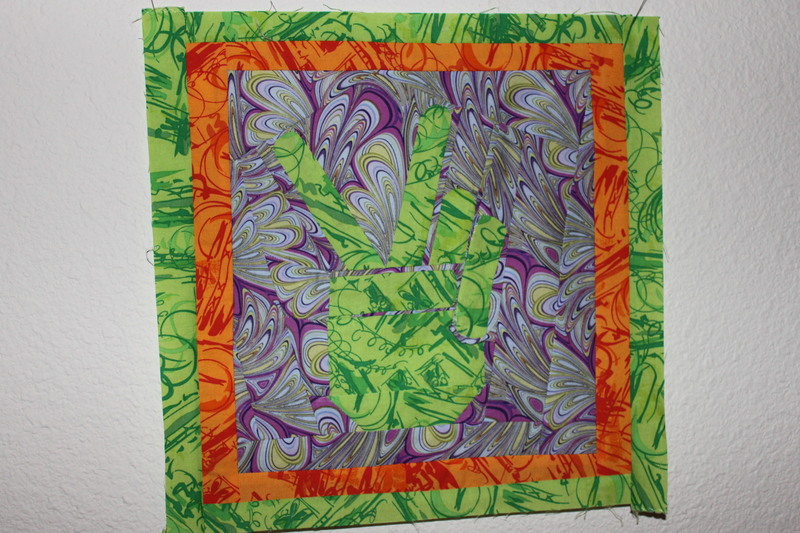 Yes, I wanted psychedelic colors on purpose — we’re talking about hippies here! April’s theme was just blue. Blue blocks of traditional pattern so the member could make a picnic blanket out of it. I was trying to use my fabric stash, and here’s a little trivia — the big pinwheel fabric with orange flowers on it is vintage fabric my mom bought in the 80’s. I love it! The rest of the block turned out a little busy I think, so next time I’ll try to incorporate better balance. June’s theme was Africa. 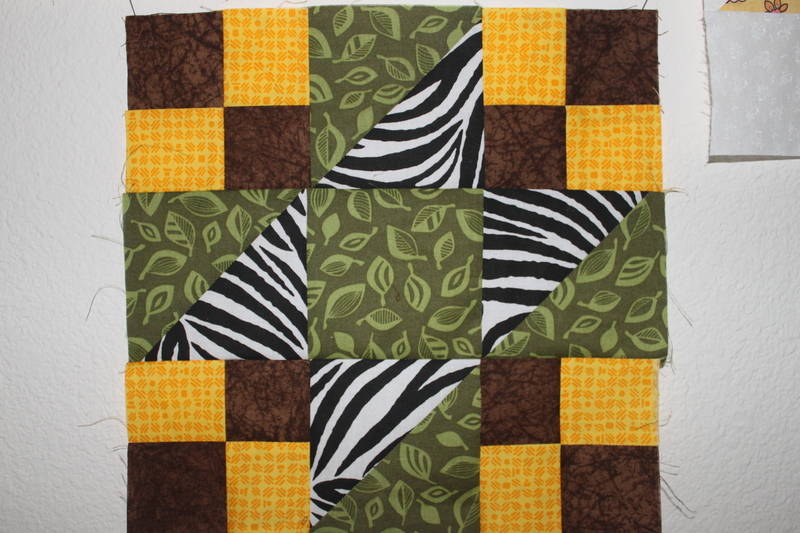 I started out doing a Dublin Steps pattern, but I liked how the yellow & brown squares looked so I decided to mirror them around the rest of the block. I think it looks like a pride of lions converging on zebras. What you are looking at is a gift for my brother-in-law and his fiance, being put together by my step-mother-in-law and myself. Maybe a kaleidoscope quilt is perfect for describing these convoluted family relationship titles? 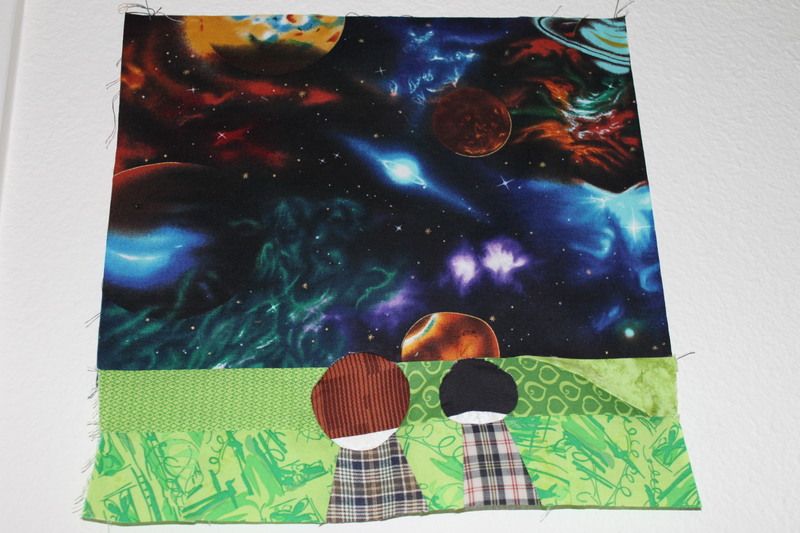 Its also the quilt that I used for my blog banner. 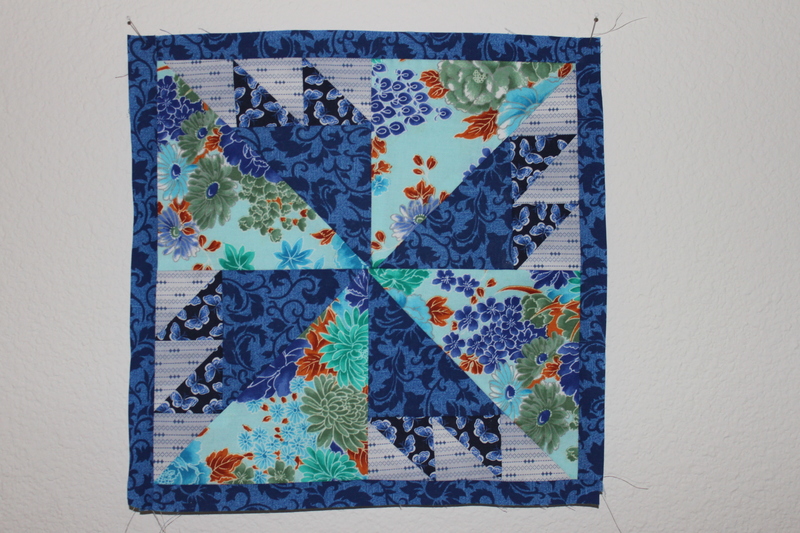 And the quilt that inspired my url & blog title, Y Seams. At any rate, it wasn’t my idea…it was Joy’s. She drew the pattern & transferred it to cardboard. I took over cutting, stripping, piecing, more cutting, and lots of pinning. We took turns pinning & sewing actually. Now I’m working on the butts of the wedges, or in other words, the corner finishing. Ideally, it will look like a turning kaleidoscope…these are supposed to be captured images of what you’d see if you were looking at the same thing while spinning the kaleidoscope in place. Lets hope it gets finished in time for the wedding!